Last week I visited Winston Chan of mybadmintonstore.com. Over lunch we talked about his store, his business philosophy as well as badminton market and badminton in general. There are a lot of interesting things that I would like to share with BadmintonCentral members. Only been here in Hong Kong for a few days, I am already getting influenced by the culture here. Hong Kong is known for being ultra efficient on everything and boy did I learn that quickly. Here, lunches are not merely for filling one up gastronomically, they are also great opportunities to catch up with old friends as well as making new ones. 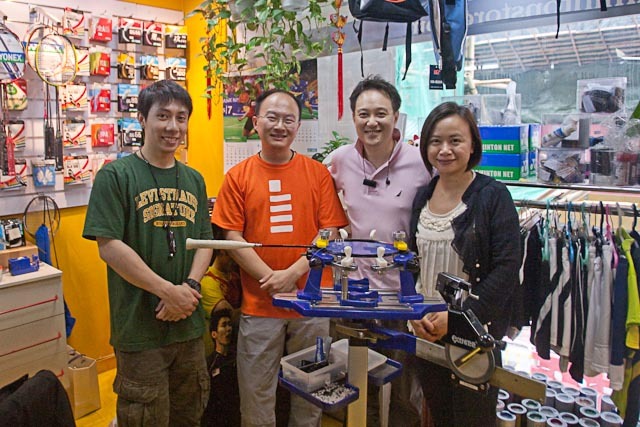 The other day I called up Winston of mybadmintonstore.com (MBS) fame to visit his shop in Sheung Wan. Winston and I chatted for ages about everything badminton. 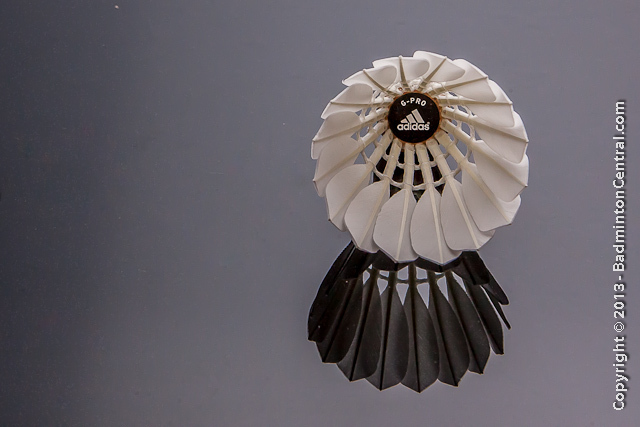 Being a local retailer as well as a major internet-based international mail order company, MBS is in a unique position in the niche market of badminton products. Getting from my office in Wanchai to MBS in Sheung Wan requires me to dig up some old memories of the complicated bus routes in HK island. MBS is located in a small computer mall in the busy Queen’s Road West, which is a major route that i am familiar with. 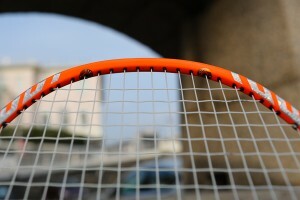 The location is a block away from the Western Market public badminton court. Winston has done his homework on location. I took an express bus from Wanchai and was in front of MBS in less than 10 mins. MBS is also a few blocks from the MTR station and that would be a good alternative if coming from far away. However, for only 3 MTR stops it was faster for me to go by bus. Winston and I in fact have a lot in common, aside from sharing a passion for badminton, we both studied in the UK. Upon finishing his study in UK, Winston ended up doing sales for large corporations in both UK and Hong Kong. During those times, Winston honed his sales and marketing knowledge and skill that he later found invaluable as a entrepreneur. With that entreprenerial spirit, MBS was born in 2004. MBS started off as a internet only store that operated out of Winston’s home. MBS as the name suggest is a badminton specialty store. 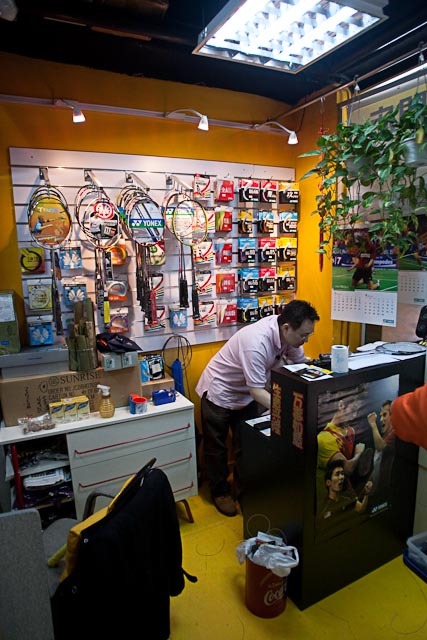 It only offer badminton enthusiasts products. 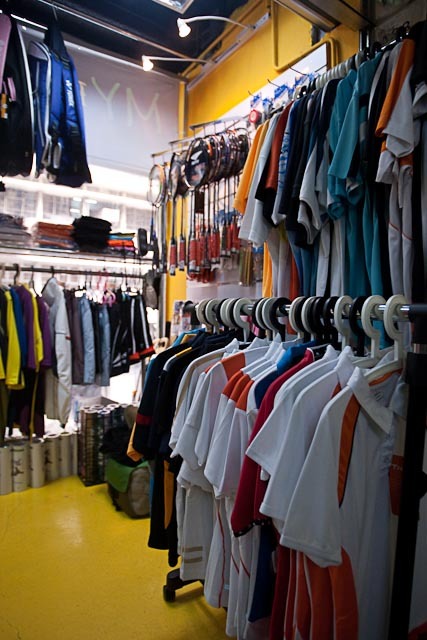 In 2008, the operation grew larger and Winston secured a corner location in a mall in Sheung Wan. MBS now employs 2 extra staff to deal with daily operations. True to Hong Kong spirit, MBS’s store front, abeit being tiny to western standard, is actually quite common in HK. Occupying approximately 200 sq ft at the far corner of the shopping mall, they managed to fit 3 active working staff and a complete set of merchandise including anything you can imagine from the common rackets, strings, shuttles, clothing, to specialty items like grommets, flying clamps and goggles. A stringing machine occupies the central location. It turns out that moving from his home to a real store front was not only a logistic move, but also a strategic move as well. Having a real store front is good for local and overseas customers to conveniently see and purchase MBS products, as well as good for MBS’ online image as a trustworthy company. Aside from the store front in Sheung Wan, MBS also have warehouses in HK. When a order comes in, merchandise gets collected in the warehouse to be sorted, packaged, and sent off to their happy customers. Over lunch Winston and I talked a lot about his operation and his business philosophy. Winston’s main business philosophy is serving the customers. He believe in providing what his customers need. 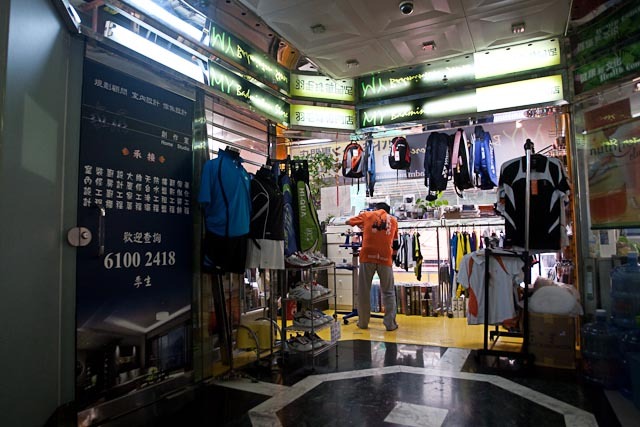 He spent a fair amount of his time not only dealing with the daily operations, but he also go out and seek out specialty badminton products that are hard to find. Rare are badminton stores that not only cater to the regular badminton player, but also cater to more enthusiast items like badminton stringers as well as rare rackets like JP and discontinued rackets. I personally was happy to see that MBS offers a lot of stringing accessories. I quickly gobbled up some Yonex and MBS flying clamps, some grommets as well as a load spreader. Many specialty items like these are difficult to find and especially rare to see under one retailer. It was certainly very convenient for me. Philanthropy is also something that MBS engages in. Eager to spread the passion of the sport, Winston believe that everyone deserves to enjoy the game of badminton. To that end, he has donated equipment to children in slums in Brazil, granting them the chance to play and share our love and passion for badminton. On top of that, MBS also sponsors local and foreign badminton teams, striking equipment purchase deals with them.